From 3 February to 20 March 2014, Vita Wells (born Béa Welsh Weicker) has a new “Flights of Mind” installation. A year ago, she had placed an installation of the “Flights of Mind” at the Berkeley Central Library, the first being in 2012 at the Oakopolis Gallery in Oakland, California. Appropriately, this latest installation was for the “11th Annual Authors Dinner,” sponsored by the Berkeley Public Library Foundation. 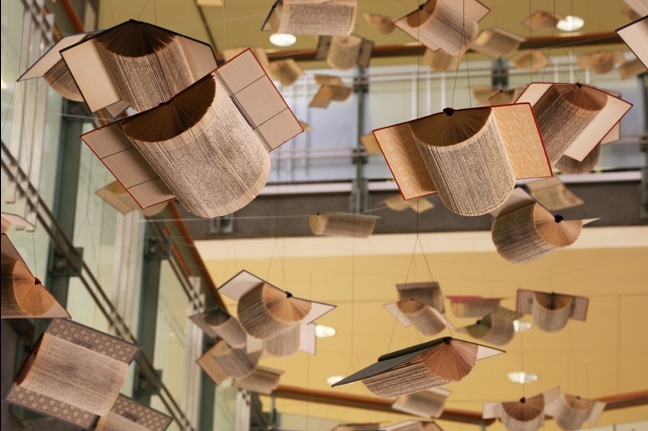 Soaring forty feet above the patrons’ heads were hundreds of altered discarded books, their covers spread into wingspans, their pages folded into rounded bird bellies and each book suspended on cables from the ceiling at varying pitches, yaws and distances from one another. They are no longer there, nor at the Oakopolis. By the installation’s name, they should now exist only in the mind, but the artist provides an extensive online “installation” with numerous pictures and videos, an essay on her intent and a detailed description of the installation’s physical characteristics. It is delightful to have access to the online version, and we may fool ourselves into thinking of it as virtual. Even the digital is subject to forensics. Still, although Wells may well take down the online installation, or its URL may be hijacked or fall into 404-dom, it is not temporary in the sense that its instances in Berkeley and Oakland were. So does its presence challenge the integrity of those temporary installations? Almost a century ago now, Yeats wrote of the swans’ “bell-beat” of wings overhead at Coole, and that poem entered the world of lasting works of art. It has its many physical instantiations in books the world over. It lives in recordings. It lives on the Web. It lives in countless minds ready to recite it. Of course, the books will rot, the recordings and sites decay, the minds fall into silence. Yet in the presence of thought become art, soaring overhead, we dare to dream of persistence even in the face of such imperfections as Wells’ “worn, frayed, … beat-up and patched” birdbooks or the challenge of the age of digital reproduction to the integrity of art. Vita Wells’ art feeds the dream.